During the 2016 Legislative Session, Alabama lawmakers adopted a rule allowing landowners to paint purple stripes on trees or fence posts as an alternative to no-trespassing signs. Properly posted no-trespassing signs remain lawful. Purple paint’s advantages include low cost, high visibility and difficult to remove. Alabama is one of several states recognizing purple paint as a valid no-trespassing marker. 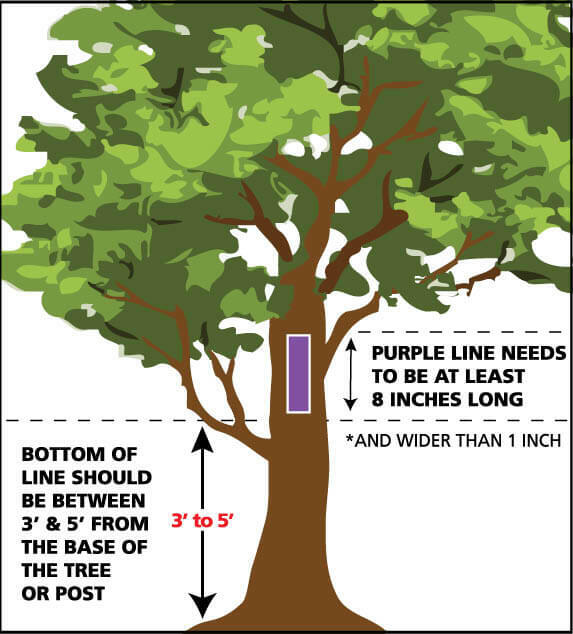 According to the Code of Alabama, vertical stripes of purple paint must be longer than 8 inches, wider than 1 inch, 3–5 feet from the ground, readily visible to people approaching the property, 100 feet or less apart on forestland and less than 1,000 feet on non-forestland.